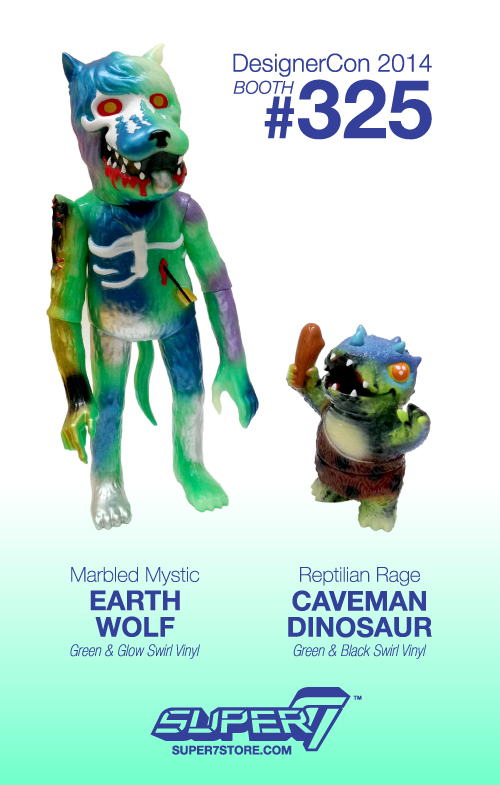 Super7 has something swirly up our sleeve for DesignerCon – The Marbled Mystic Earth Wolf and Reptilian Rage Caveman Dinosaur! Earth Wolf is cast in soft green and glow-in-the-dark swirled vinyl with metallic blue, purple, silver, gold and black sprays. With him is the mighty Reptilian Rage Caveman Dinosaur, ready to rumble at all times in mossy green and black marbled vinyl with baby blue, lavender, brown and cream colored sprays. Both figures will debut at DesignerCon, visit us at Booth #325 next weekend, November 8th and 9th at the Pasadena Convention Center! Marbled Mystic Earth Wolf and Reptilian Rage Caveman Dinosaur!